Yodeler had a visit from the dentist on Monday! He had his teeth “floated” which is a term to describe having the sharp edges of his teeth filed down. This is typical maintenance for most horses to ensure that they are able to chew properly and get the most from their feed. He is tentatively scheduled to work a 1/2 mile on Friday morning at approximately 9:20 am. You are welcome to come out to watch and he will be wearing his saddle towel. However, if the work goes as planned, that means he will walk on Saturday and will not train on the track. Saturday, we do plan to still have barn visits so if you’d like to attend, plan on meeting at the track apron above the paddock at approximately 10:30. Dana and Rosy will take groups down to the barn from there. Wear your lanyard please and friends and family are welcome to attend. A reminder that Saturday is KY Derby Day and we have an early post time of 1 pm. 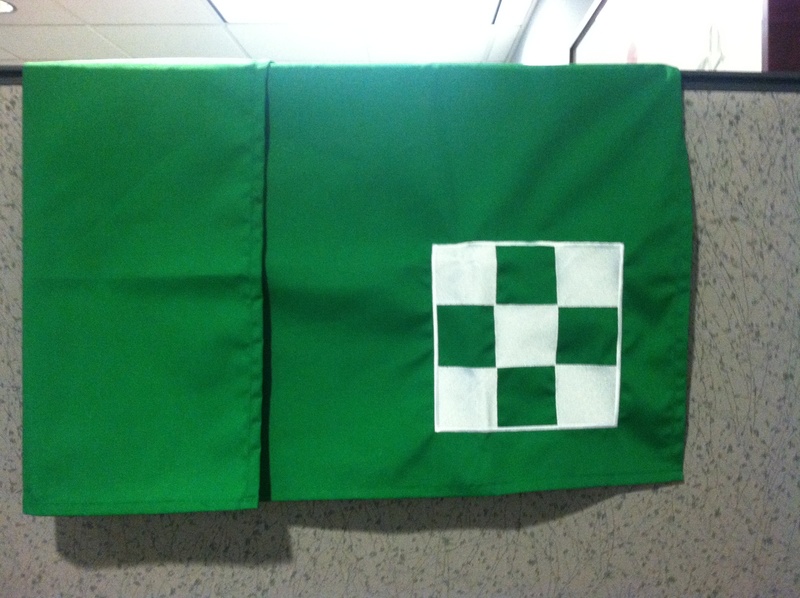 The Emerald Racing Club saddle towels have arrived for Yodeler. He will be wearing these in the morning when he goes out to train so it will make it easier for Club members to spot and identify him. He typically goes out third of fourth after the break which puts him on the track 9:30 or onwards. The Farm Tours have been scheduled for Saturday, May 17 & Sunday, May 18. Three of the top farms in Washington State are generously opening their doors to the Emerald Racing Club both days from 10 am – 3 pm. You are welcome to bring friends and family along. 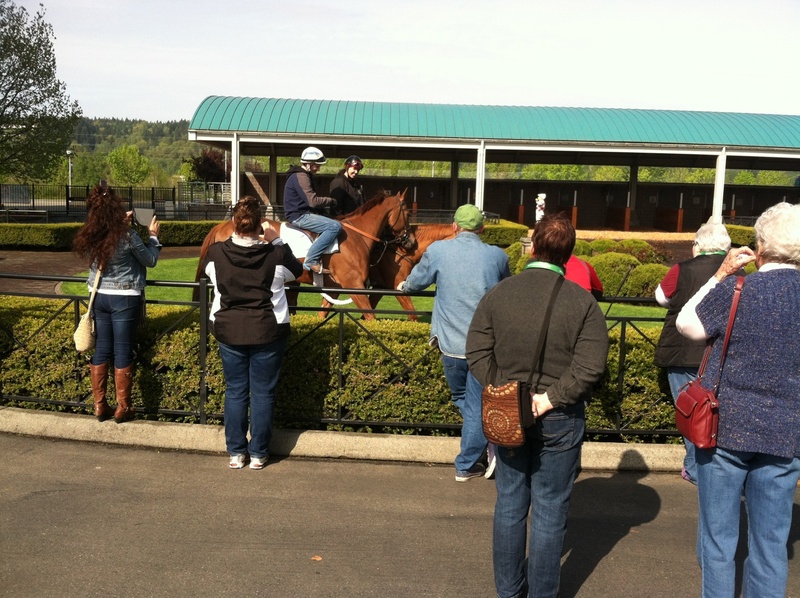 The farms are located within 30 – 45 minutes of Emerald Downs and you may visit at your leisure during the hours listed. They are close enough in proximity that you may have time to visit all three. Dress appropriately – you will be at a farm so wear appropriate footwear and clothing. Blue Ribbon Farm has earned the Top Breeder Award for the last three years in a row and stands the stallions Atta Boy Roy and Nationhood. 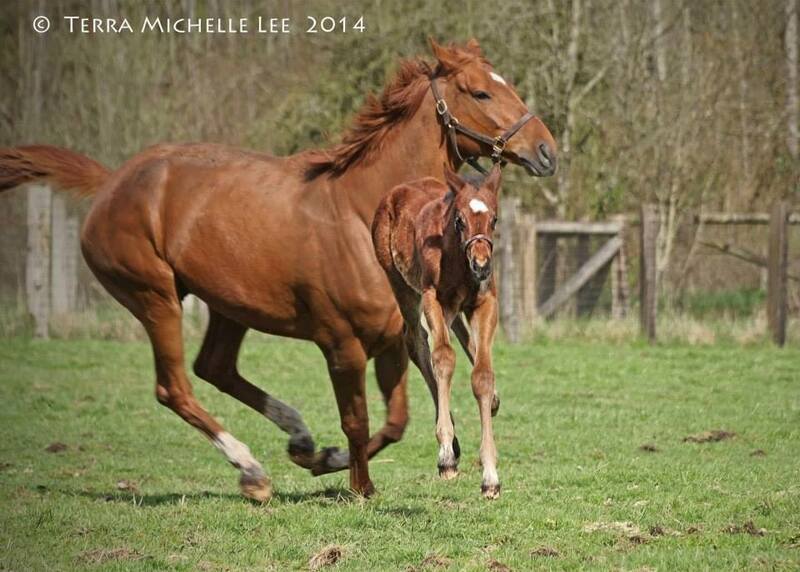 They also breed and race their own horses and provide foaling services. Blue Ribbon Farm is owned by Rick and Debbie Pabst. If you attend the races on Mother’s Day, Blue Ribbon Farm will be bringing a mare and foal to the races for the occasion. Griffin Place is located on the same street as Blue Ribbon Farm. Griffin Place has a strong history of breeding, raising and selling top class horses. They were WA’s Leading Breeder by money won in 2000. That year, two of their homebreds, Rings a Chime and Best Judgement became WA Champions. Rings A Chime was their first G1 Stakes winner, and WA Horse of the Year. Her dam, Outofthebluebell was voted Broodmare of the Year. Expect to see lots of broodmares with their babies at this farm. Griffin Place does not stand any stallions. El Dorado Farms is owned by Ron and Nina Hagen. El Dorado Farms has also earned WA Breeder of the Year award, most recently in 2009. They are a full service facility, standing five stallions, Abraaj, Car Talk, Coast Guard, Private Gold and Raise the Bluff. They breed, raise and sell Thoroughbreds. 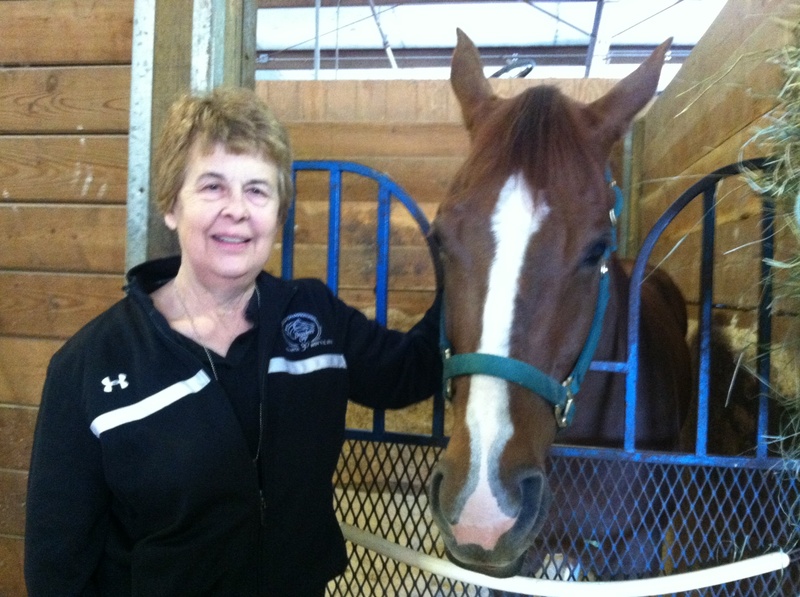 They also provide rehab and layup facilities and have a nurse mare program. They will show stallions, mares with foals at side, and possibly add vet work with ultra sound showing pregnancy’s and heart beats. Nina Hagen with top WA Stallion Cahill Road. He passed away in 2010. One of the great joys of racehorse ownership is designing and having your own silks made. 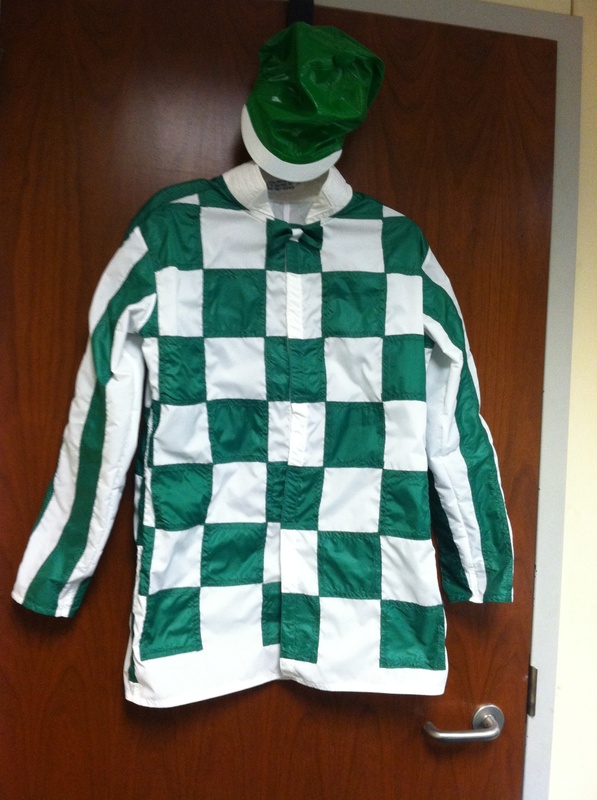 The Emerald Racing Club silks arrived today and here they are! A lot of thought went into the design of our silks. First and foremost we wanted something that was easily recognizable. Secondly, we got a bit whimsical and wanted something that captures the dream of owning a racehorse. If the silks look familiar, try picturing them in blue and white. 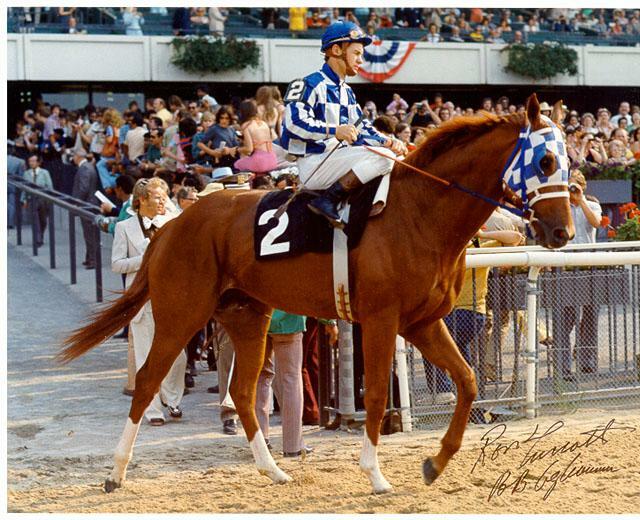 And then picture them atop another chestnut horse…named Secretariat. 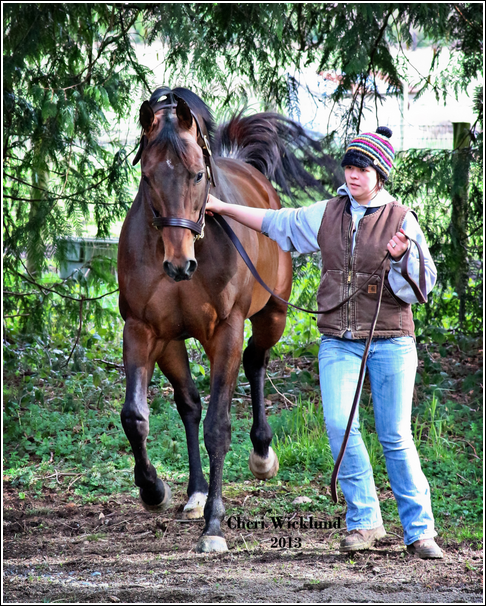 If you delve into owning racehorses on your own, this fun step is part of the process. Jan Baze (the Horsemen’s Bookkeeper that most of you met when you got your Horsemens passes and parking) makes them by hand. You can bring her a sketch of what you’d like, or she can help you design them. The cost of the silks, pending the final invoice, is $230. After receiving them, I then went next door to the racing office to “register” them with Jan McDowell. At that point a brief description is put into their computer. When Yodeler is entered to race, the computer will then generate that description to go into the program pages. The next time you go to the races look at the owner’s silks. And then try to guess what significance they have to the owner. Spooner Farms own racehorses and their silks have a red strawberry on the back. An obvious nod to their strawberry farm. Many of you ask great questions about Yodeler’s past. I get the bulk of the answers for you from his official Past Performances (PPs) from the Daily Racing Form. Dancing Yodeler – Past Performance provides details such as his age, his breeding, how many times he has raced, and on what surface. From this information we can make some generalizations as to what level of competition he is successful at, what type of surface he likes, and what distance he performs the best at. We can even see that Yodeler has made over $100,000 on the racetrack – quite a successful career thus far. There’s a wealth of knowledge in those PPs if you know how to read them. Rather than go into a lengthy explanation of each detail, I’ll link to the Daily Racing Form’s “How to Read Past Performances.” It’s a pretty good tutorial that covers the main points much better than I can. We had initially planned to watch Yodeler train and do barn visits on Sunday. This has been cancelled and there will be no “official” Emerald Racing Club activities this weekend. Yodeler will still train as usual, and you are welcome to come out and watch morning workouts and visit the kitchen, but we do not have volunteers available to help facilitate the barn visit like we did this past Sunday. I’ll do my best to post here when I know approximately what time he’ll train each day. Yodeler came out of his easy workout in fine fettle. He jogged Wednesday morning over a muddy track in front of myself and ERC member Glenn and he looked great. He’s fit, so most of what he’s doing now is just maintenance and keeping him happy. Exercise rider Brian had a great big smile on his face as he went by! On Monday, Yodeler posted his first official “work” over the Emerald Downs surface. A “work” is a reference to the horse performing at speed over a set distance. It is traditionally captured by the track clockers that sit in the Stewards’ stand on the 6th floor with binoculars and stopwatches. Yodeler worked an easy 1/2 mile (remember the red and white poles?). His time was 49.60 seconds. As far as times go, this was middle of the pack – 28th fastest of 54 works for the morning. You can find all this information yourself by going to http://www.emeralddowns.com, Click on “Racing” tab, then “Workouts”. The link will then take you to Equibase’s website where you can select the date (4/21) and then look for Dancing Yodeler’s name. The horses are listed in order of distance worked first so you have to scroll down past the two furlong and three furlong works first. 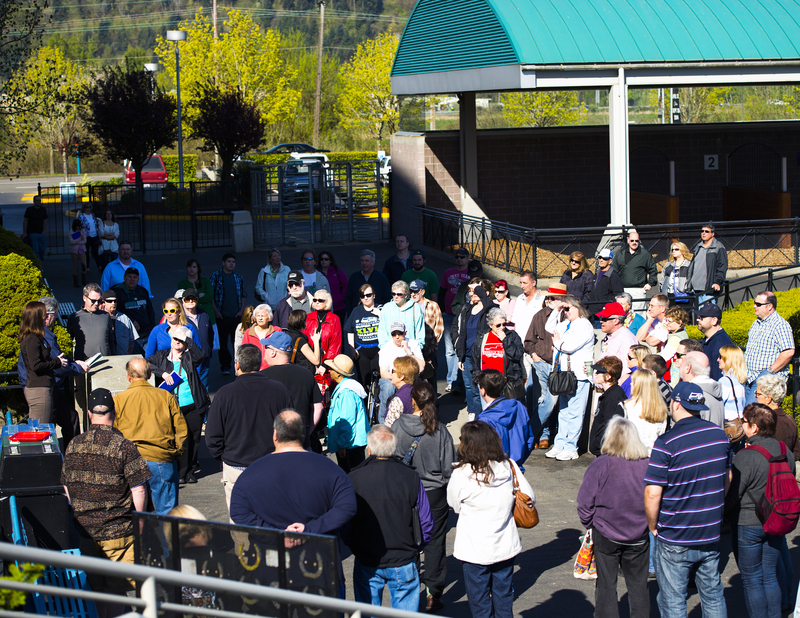 Thank you to all that were able to attend Orientation and the races last Sunday. We all had a great time and covered a lot of material. We’ll try to cover the main points of orientation again here for those of you that weren’t able to attend and a reminder for those that were there. The morning started with watching training on the track apron (the area where the benches are located in front of the Grandstand). Yodeler trotted straight out on the track past the grandstand to about the 7/8ths pole, then gallop energetically a little over a mile back to the 5/8ths pole. He then pulled up and trotted back clockwise around the track back in front of the Grandstand again. 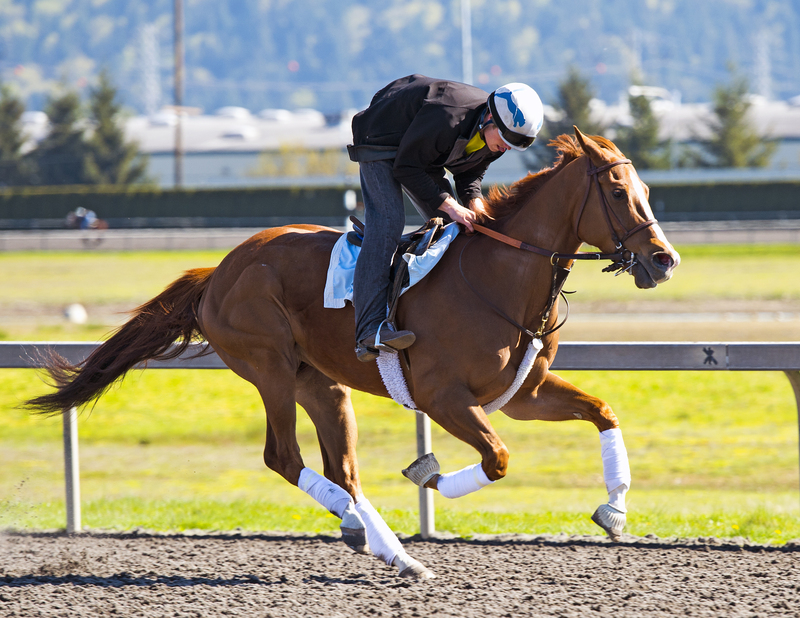 Yodeler gallops over the Emerald Downs surface for the first time. Photo by Emerald Racing Club member Wayne Nagai. At Emerald Downs (and tracks the world over), red and white striped poles are located every 1/4 mile. You may have heard the term “quarter pole”. Since our track is one mile around you will find four red and white striped poles. The 1/8th poles are located in between the red and white and are green and white striped. The 1/16th of a mile poles are black and white and are more slender than the others. 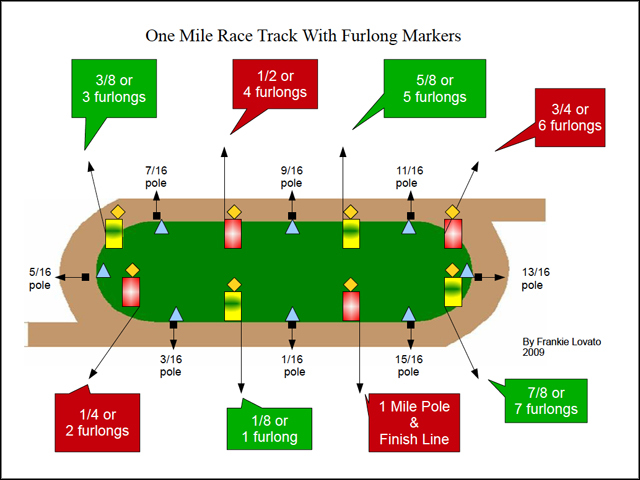 The next time you are at Emerald Downs, start at the finish line and work your way backwards down the track and see if you can identify all the poles. The first you’ll find is black and white and is 1/16th from the finish. The next is green and white and is 1/8th of a mile from the finish. Then a red and white 1/4 mile from the finish. After Yodeler galloped the tram went back to the vet clinic for a quick tour before returning to drop Club members off for orientation in the Emerald Room at noon. We covered three main topics with three speakers. Hank from Backstretch Security went over the Backstretch Rules. Rosy covered Backstretch Safety. And I covered Training and Activities schedule. 1) Backstretch Rules – The Backstretch is the restricted area limited only to licensed individuals. You will be asked to display your racing license at the security gate when entering. Owners may park in the LUV lot located immediately to the left of the main security entrance. However, you assume all risk and liability for parking on the grounds. Should a horse get loose and damage you OR your car, you are responsible for any damages. Be alert and we recommend parking outside the backstretch gates either by the public parking near the QuarterChute Cafe or in the Preferred Parking lots. There is no driving in the backstretch during training hours. 2) Barn Safety – This was covered by Rosy and her speech is Backstretch Safety. It truly comes down to having “horse sense”! Horses can be very reactive and it is your responsibility to look out for YOU! Don’t stick your fingers in their mouth, approach quietly and respectfully, and keep your eyes and ears open at all times. Please read Rosy’s speech as she covered a lot of good points on how to act around horses. 3) Activities and Training – Determinations on what is best for Yodeler’s training happens in the morning when Sharon arrives at the barn and goes over him. Because of this, training schedules are always subject to change and while we can plan for something, we may have to adjust our plans based on the horse or the weather. Great example was we had planned a training morning for the group on Saturday, April 19. About mid week Sharon felt Yodeler was ready for a workout and would go Sunday if the weather was good. We adjusted to Sunday (posted details to the blog), and then the rain came down in buckets Saturday afternoon cancelling Sunday’s workout. Subsequent update to the blog was posted this morning about 7:30 am. However, Yodeler still jogged and then visited the paddock this morning so Club members could see him. Saturday, May 3 (Rosy & Sophia hosting): time and exercise TBD. This is KY Derby day so stay for the races! Sunday, May 11 (Rosy hosting): time and exercise TBD. If you would like to visit Yodeler in the barn please email emeraldracingclub@gmail.com with the date and time you’d like to visit at least one day prior to your visit. We ask that you email (not call) for the quickest response. We will then check with Sharon Ross to make sure the time will work and then confirm the time back with you. Training hours are 6 am – 11:30 am. The track is closed for training on Tuesdays. If Sharon knows when you are coming, she can plan to send out Yodeler to train at a time you’ll be able to watch. The barn is not open to visitors after 1 pm. The afternoon is the quiet rest time for both horses and grooms. Please respect these restrictions and do not plan your visit after 1 pm. The exception is visiting during the afternoon on race days provided you request it ahead of time and receive approval. We are monitoring the email constantly but our “weekend” is Mondays/Tuesdays so we may not respond quite as promptly on those days. In case of emergency, you may reach me (Sophia McKee) on my personal cell phone: 253-508-9441. 1) No visits after 1 pm (except pre-approved visit on race days). Request your visit at least one day ahead of time. 2) Do not walk through other people’s barns. 3) Wear your green lanyard with your racing license. 4) If you have guests accompanying you, you must sign them in at security and accompany them at all times. 5) Horses bite, kick and can be reactive. Use good “horse sense” when in the barns. NEVER reach out to a horse you don’t know and keep your eyes and ears open at all times. 6) Be respectful. 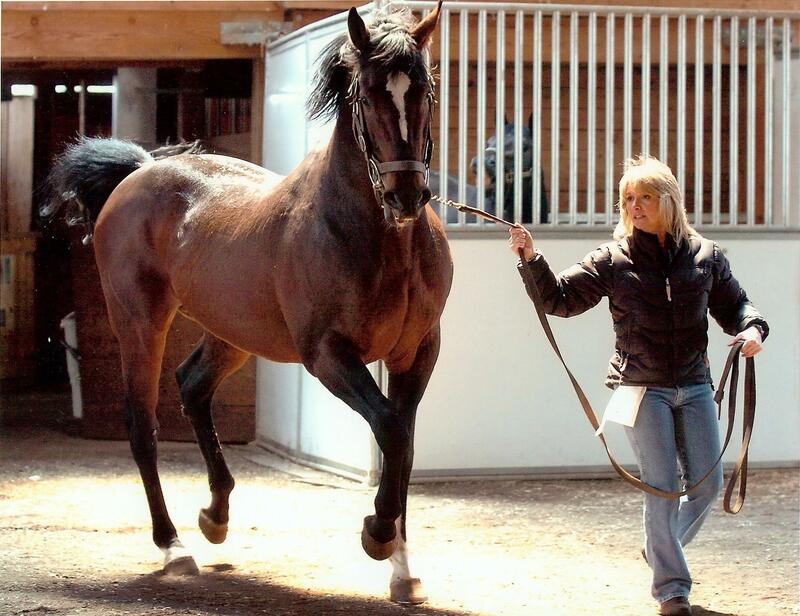 There are 19 other horses in the Ross barn owned by others. 7) DO NOT feed Yodeler any treats. Sharon has a bag of carrots just for him that you may feed him. Have fun! Take a picture! Yodeler with ERC member Joy Carlson. Parking: Your owner pass gains you access to the “Preferred Parking” lots. Admission and Seating: Your license and Horsemen’s passes are good for admission. Your friends may use your Horsemen’s passes to accompany you. Reserved Grandstand Section 15 is available every race day (except July 3) for FREE seating for licensed horsemen. Please just show your license to the usher and you and your guests may sit in that section. Training: You are always welcome to watch training from the track apron and Quarterchute Cafe (track kitchen). If you just plan to attend to watch the horses gallop and have breakfast, you do not need to let us know. However, if you’d like to go back to visit the barn let us know per the instructions above. The best way to watch training is to park at the Quarterchute Cafe, enter there and then walk up the outside of the track to view the workouts. The main Grandstand entrance is not always open. I apologize for the delay in getting this post up for those that were unable to attend. Sadly, I had to attend a funeral out of state and had limited internet access. However, I think this brings everyone up to speed. We are still looking to claim a second horse and have a couple prospects worth exploring! Yodeler’s work has been cancelled for this morning due to track conditions. He will jog instead and then school in the paddock so club members can see him. Time remains the same. Jockey Felipe Valdez will be at the paddock to meet the group and answer questions about being a jockey. Then Dana will take small groups back to the barn. Dancing Yodeler is scheduled to work for the first time this Sunday. He is set to be on the track third after the break, at approximately 9:45 am for a half mile work, weather permitting. 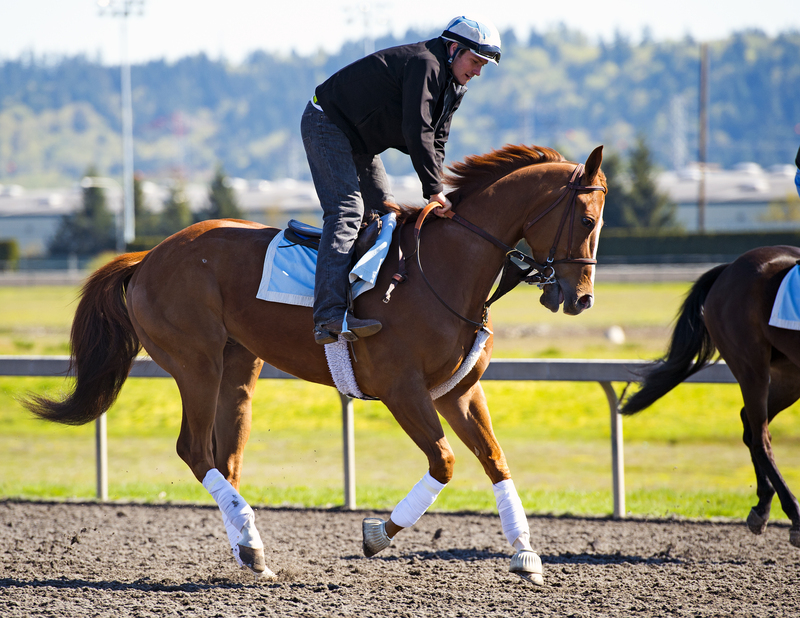 This will be his first timed work over the Emerald Downs surface. Nina and Dana will be on the track apron at 9:30 am to meet everyone and answer questions. Fun fact: those who were here for the orientation learned that the track apron is the blacktop between the grandstand and the racetrack. After Yodeler is done on the track Nina and Dana will be escorting club members back to the barns in groups of 10. There is no need to RSVP for this Sunday, but please wear your lanyards! To get into the track on Sunday please go through the main admission gates as the paddock gate will not be open. As long as you have your Horseman’s pass or Owner’s License you will get free admission. And remember, if you want to stay for the races Sunday there are reserved seats in grandstand section 15. 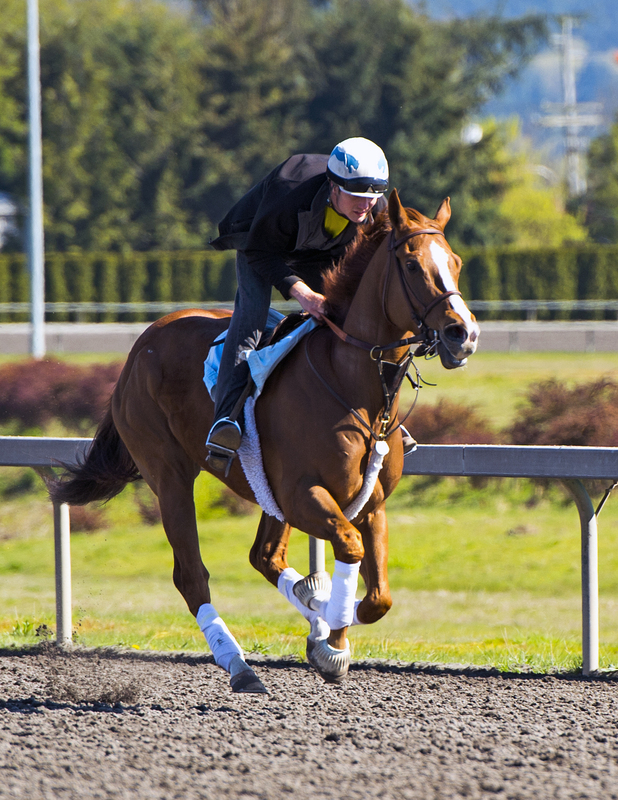 Dancing Yodeler took to the track today for his first ever gallop over the Emerald Downs surface. The chestnut gelding wowed his new owners with a rigorous gallop under exercise rider Brian, who tipped his hat to the crowd as he went by! The club members then visited the Vet Clinic before continuing the day with orientation in the Emerald Room. Racetrack policies and schedule to be posted here later this week for those of you unable to attend today. But for now, here’s photos of Dancing Yodeler compliments of Emerald Racing Club member Wayne Nagai. Thank you Wayne! If you’d like your photo added, email emeraldracingclub@gmail.com. Dancing Yodeler is expected to train “second after the break” today on Sunday, April 13. He will be stepping out on the track at approximately 10:20 am to go for an easy gallop. I hope you all brought your cameras to catch your racehorse in action! Jockeys will also reference this, “I can catch you third after the break,” might mean the jockey has two other horses to get on for trainers before they can get to yours. This morning, Yodeler will be galloped by an exercise rider named Brian. Typically the jockey will only be in the saddle for high speed workouts. And an update regarding the tram tour. The tram will only be visiting the vet clinic this morning and not the stable area. The trams are only permitted in the stable area after the track has closed for training and the track won’t close for training until 12:30 am today. Typically the track closes early (about 11) which we had initially planned on, but we’ve had to adjust slightly! The rest of the day’s activities will continue as planned with the added bonus of getting to see Yodeler have his first gallop over the racetrack since he arrived.